Late last week, the papers carried reports of Business Secretary Vince Cable’s plan to slash the maximum award for unfair dismissal from its current level of £72,000 to whichever is the lower of the national median wage (currently around £25k) or the employee’s annual salary. That means someone on a salary of £40,000 a year receiving a maximum of around £25k, and someone on £15k only receiving £15k – for unfair dismissal. If a tribunal rules that an employee wasn’t unfairly dismissed, that person gets nothing – which means that while decent, fair employers have little to fear under the current system, unfair, ‘shark’ employers stand to gain massively from being able to sack people without reasonable cause. Measures are also being discussed to impose fines or costs on ‘frivolous’ claims – but as no employee will know for sure in advance whether his or her case might be considered frivolous, this means that many with genuine claims will be afraid to proceed just in case they end up getting fined. Unscrupulous employers will be laughing all the way to the (probably equally unscrupulous) bank. It’s very clear now that the Beecroft report’s ‘no-fault dismissal’ recommendation was used as a bogeyman – a ruse to draw the attention of media and campaigners – so that the lesser (but still horrendous) measures could be slipped through. Cable’s aides, wishing not to sound too triumphant at his mighty accomplishment of not supporting no-fault dismissal (whereby an employer can sack someone just because he feels like it), have been busy underlining that around 80% of Beecroft’s total recommendations are either already implemented, or currently in consultation, though these measures are not receiving much if any coverage in the media. Cable, Tory ministers and the Institute of Directors are reported to be very happy at the planned legislation, whose justification is supposedly that it will free employers to employ without fear of the dreaded ‘red tape’ – thereby magically kick-starting the failing economy as employers all rush to take on new staff, knowing that if they decide to get rid of them even unfairly, they face minimal consequences. I don’t believe any right-thinking person can say that it’s a morally good thing to remove protections that discourage the powerful from treating the less powerful unfairly. But pragmatically, if it would really help to get the economy moving, some might say it’s an acceptable, if Faustian, compromise. But does it help? Is there any objective evidence that weakening employee protections boosts a country’s economy? In May, I looked at a similar claim by the Tories (to support George Osborne’s infamous tax-cut for the richest in this year’s budget), that cutting taxes promotes employment – and the truth turned out to be that not only did cutting taxes not boost economies, but that countries with higher tax-rates tend to have stronger economies. So let’s take a look at the new claim and see whether it holds any water. As you can see from the graph, Cable wasn’t wrong when he said ‘Britain already has very flexible labour markets‘ – the UK has the joint 2nd-weakest protections for permanent employees before the proposed changes. (He was wrong – completely so – when he said that “well over one million new private sector jobs have been created in the last two years“, as a quick look at this analysis of the same comment, or lie, by David Cameron to Parliament last week shows). Our overall protections, including legal requirements for mass dismissals and protection for temporary workers, are also the 3rd-weakest – again, before any of the new changes. The graph also shows – to the shame of the UK’s so-called leaders – that the level of protection for UK workers is only about 1/3 as good as that provided by such notoriously-exploitative nations such as China, India, Indonesia. At first glance, we can already see that the UK has both one of the lowest level of employee protection and one of the lowest levels of economic growth (in fact, possibly the lowest now, since this graph was compiled before the recession. 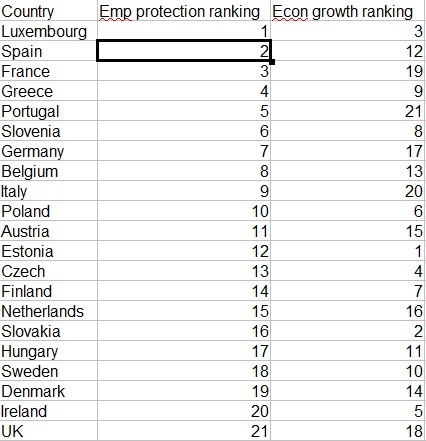 In this table, I’ve listed the countries in order of their level of employee protection, starting with the strongest and going down to the weakest. The second column shows their relative positions in the economic growth ranking. The first thing that leaps out is that the UK – before the new planned measures – already has the lowest level of employee protection of all the listed EU countries. At the same time, we also have close to the lowest growth rate (and now probably the lowest). The other thing that leaps out is – that nothing leaps out. 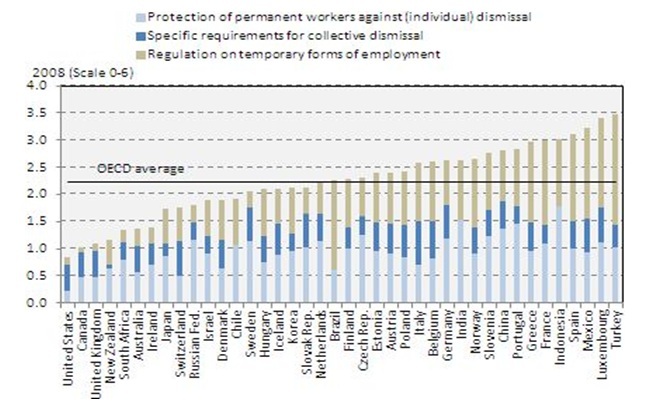 There is no correlation between level of employment protection and level of economic growth. Either the fact that we are bottom of both employee protection and economic growth, or the fact that there is no correlation over the table as a whole, would be a strong indication that the UK stands to gain nothing by cutting employment protection still further. But both facts together make it absolutely clear. The government knows this – it has access to these figures and lots of others that will tell exactly the same story. So if they’re not doing it to ‘kick-start the economy’, why are they doing it? The excellent economist Paul Krugman wrote this week of a cynical right-wing tactic that he observes in the US – that the Republicans take every step to obstruct economic recovery so that they can exploit it for their own political ends. Similarly, economist and writer Naomi Klein writes in her outstanding book ‘The Shock Doctrine‘ of how right-wingers exploit crisis as an excuse for pushing through measures that would be hard to pass in normal times. We’re seeing exactly that here. The vast majority of the government’s measures – whether it’s tax cuts, spending cuts, legislative changes, privatisations, attacks on pensions, decimation of services and welfare benefits, or anything else – are neither fiscally necessary nor will have any positive impact on economic growth. They merely fit with the ideological preconceptions of the Tory party which holds sway in the coalition government. And they should be understood, and exposed, as such.